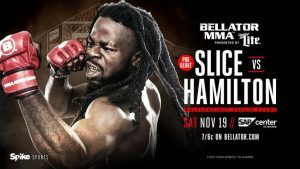 Kevin Ferguson Jr., will make his twice-delayed professional mixed martial arts debut this Saturday, November 19, at Bellator 165. 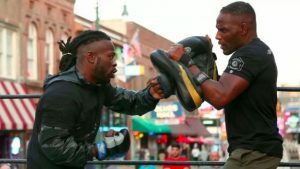 The 24-year old son of the late Kevin Ferguson Sr., most affectionately known as “Kimbo Slice,” has taken on the moniker “Baby Slice” as a tribute to his father. Slice will be taking on Aaron Hamilton on the preliminary portion of the card being held at the SAP Center in San Jose, California. We caught up with the youngster to get his thoughts on a variety of topics to include the loss of his father, this weekend’s fight, training, and more. MyMMANews – 2016 has been such a roller coaster ride for you. First the tragic loss of your father, a beloved figured in the sport, followed by you being signed to Bellator MMA, then scheduled twice to fight but both fights falling through, and now, a third fight scheduled for November 19 against Aaron Hamilton. Can you put into your own words what this year has been like for you? MyMMANews – No matter what you say or do people are always going to try and make comparisons between you and your father. It’s just the nature of things and it happens all the time. Ryan Couture who also fights for Bellator is often compared to his father, Randy Couture. People want to know if he measures up to the talents of his father. How do you handle that pressure knowing that people are always going to be comparing Baby Slice to Kimbo Slice? 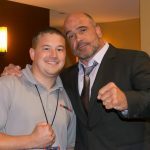 MyMMANews – As we said earlier this is your third attempt at making your Bellator MMA debut. You are going up against Aaron Hamilton at Bellator 165. A lot of eyes are going to be tuning in. What can the fans expect to see from you on November 19? MyMMANews – You’ve been training with Antonio McKee. He’s been around the sport for a long time. What have you been learning from him and how has he enhanced your game? MyMMANews – If you had to make a prediction, how do you see this fight going down at Bellator 165? If you could look into your crystal ball and predict how your pro debut will go down, what do you see? MyMMANews – You were signed to Bellator MMA after having just one amateur fight. And it was a quick fight. You got the job done in just under 90 seconds. With that being said, how are you preparing yourself mentally to make this giant leap from the amateur stage to not only the professional division but to the bright lights and everything that comes with being a part of Bellator. It’s a huge jump. How do you prepare for that? MyMMANews – Lastly, if you want to let the fans know where to follow you on social media or if there are any sponsors you want to thank or plug, the floor is yours.